A Garbage Plate is a combination of one selection of cheeseburger, hamburger, red hots, white hots, Italian sausage, chicken tender, fish (haddock), fried ham, grilled cheese, or eggs; and two sides of either home fries, French fries, baked beans, or macaroni salad). Left: A red hot garbage plate. On top of that are the options of mustard and onions, ketchup, and Nick Tahou's proprietary hot sauce, a greasy sauce with spices and ground beef. It's served with rolls or Italian toast on the side. 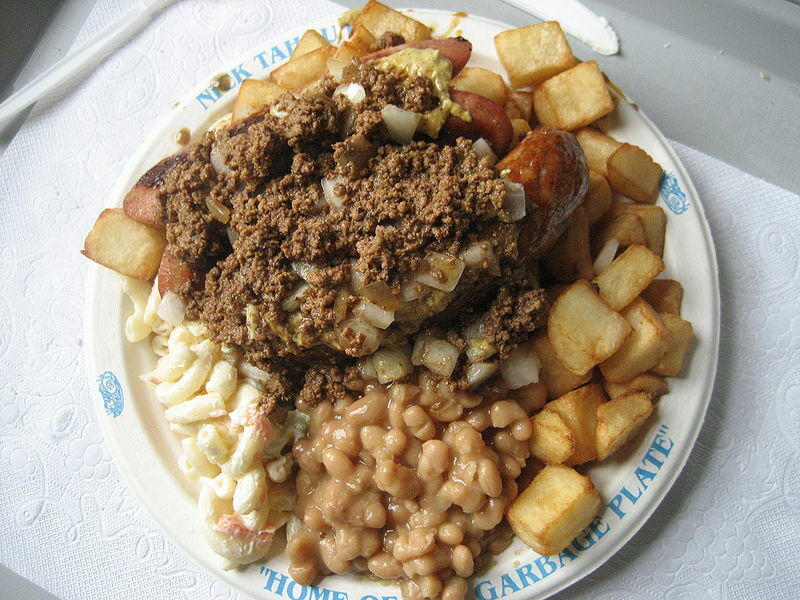 The dish was invented by Nick Tahou and is served at the restaurant that bears his name, Nick Tahou Hots, in Rochester, New York. While there are other Upstate New York variants, Nick Tahou's is the originator of the Garbage Plate and, as holder of the trademark, the only restaurant able to use the name.